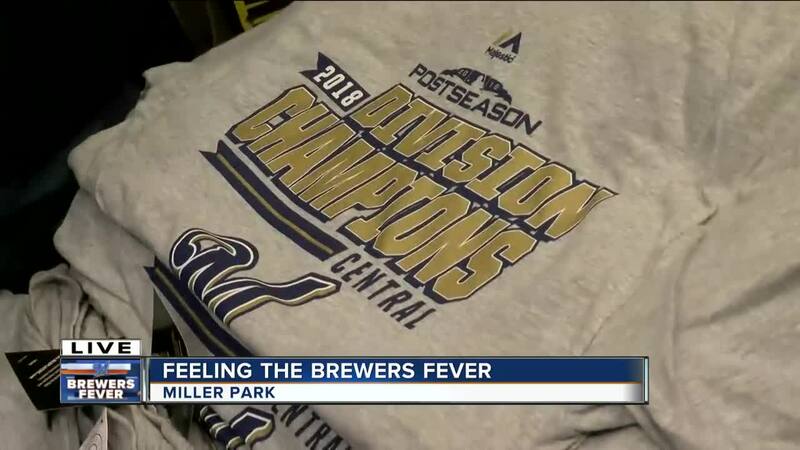 MILWAUKEE -- Milwaukee Brewers fans are excited to buy postseason gear after their team won the NL Central title at Wrigley Field Monday, and the team plans to accommodate that excitement. The Brewers Team Store at Miller Park will be open non-stop until 8:00 p.m. Tuesday to give fans their first opportunity to purchase NL Central Division Champions apparel and merch. The 'Postseason Madness' sale will include other activities throughout the overnight period including a gift with each purchase, free breakfast and lunch, hourly drawings, mascot visits, and much more. Fans who make a purchase of at least $100 will receive two tickets to 2019 Brewers on Deck, while supplies last. The first 200 people who arrive at the store starting at 7:00 a.m. Tuesday will also be lucky enough to get coffee and doughnuts with team mascots. Get more information on the Milwaukee Brewers team store website here.